...and I'm not sure why I wasn't sure, because I have quite a few Inglot products and frankly, they're (by and large) pretty damn good. So I took it out of my "stash of things to review" (getting depressingly larger in indirect proportion to the amount of time I have available to review them, but sure that's not a bad complaint). Anyhow, first impressions: it's a strange one. Looks-wise, it has the appearance and feel of a slightly milky-looking serum. Texture-wise, the same. Scent-wise, there's no particular smell. So far so interesting. But! I wasn't sure how it should be used. There are no instructions on the bottle and nothing on the website. Looked at the ingredients... it has a silicone base... so I figured it could be used in the same way as any oil-based makeup remover, rather than the old-fashioned cotton-ball-swipe-it-on-move-it-around-then-remove-it approach. I used about the same amount as I use of my Shu Uemura (look here) and massaged it into my skin, including my eyes, then removed it with warm water and a facecloth, in other words, the same as with an oil-based makeup remover. I had to use a tad more of it than I usually would my oil-based cleanser, and I had to work it in (gently though) a bit longer than usual, but it removed every single bit of absolutely everything, including long-wear liner and waterproof mascara. I was genuinely seriously impressed with this. Maybe all the more so, because I started out scooby-dubious. 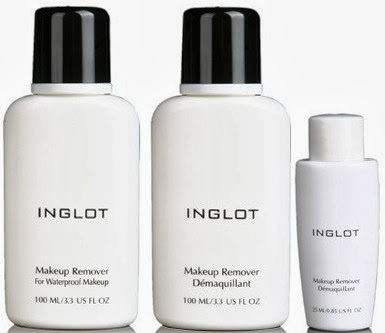 Trying to research this led me nowhere really, and Inglot's own site (here) has very little information beyond the fact that it doesn't contain parabens and isn't tested on animals (the UK site has even less information than that). I have to say, aside from a very minor amount of eye stinging when I hopped around looking for a clean washcloth (I never, ever remember to bring one into the bathroom with me), which disappeared the second I rinsed off with water, I was, and am, impressed. Before I used it, I couldn't decide if a silicone-based makeup remover (instead of an oil-based remover) was the dumbest idea I'd ever heard, but why not? After all, about 99% of all dual phase eye makeup removers (look here) are also water-and-silicone based after all, not water-and-oil, as most people think. My skin afterwards was fine - this product is not overloaded with silicones, so if you rinse properly, you're not going to have that annoying smooth silky false silicone feel to your skin that I really just don't like. It's available in a non-waterproof formula (I haven't used that one). Size-wise, you can get 100ml and 25ml bottles (the latter is handy to try it out or for travelling, if you wish). Price-wise, it's also great at around/under a tenner for 100ml.